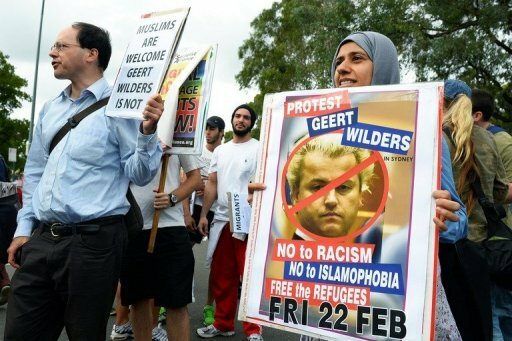 Wilders’ inflammatory speeches against Islam in Australia, have triggered protests from Muslims in Australia. CAIRO – The launch of a new anti-Islam political party in Australia has sparked condemnation from leaders of the Muslim community and major Australian parties as fueling racism and bigotry against the sizable Muslim minority. “Extremism often leads to strife,” Warren Truss, the leader of the National Party of Australia in the Parliament of Australia and the deputy prime minister, said in Canberra on Wednesday, The Guardian reported on Thursday, March 6. Truss’s comments followed the announcement that a new anti-Islam party, the Australian Liberty Alliance, would be introduced in a conference next Friday sponsored by Q Society in Melbourne. Titled “Islam and liberty”, the conference will be held in a secret location with the attendance of two speakers the American anti-Islam bloggers Pamela Geller and Robert Spencer. “It’s a bringing together of many people who are concerned about the march of Islam into many western democracies, and how it changes the laws and values of western democracies,” Q Society’s spokesman, Andrew Horwood, said. “You get segregation when you get Muslims coming in, because their core belief is that Muslims are better people than non-Muslims. “We’re keen to have integrated societies, but we think it’s important to have integration, not segregation.” he added. “Another anti-Muslim party, Rise Up Australia, had much better reach than the Q Society, and preferences from the Liberals in some states, and despite all that they got nowhere,” said Keysar Trad, a Muslims Australia spokesman. Bill Shorten, the Leader of the Labor Party and Leader of the Opposition since October 2013, has also condemned the new party’s policies. Those who “preach simple solutions for the future of this country are often just leading Australians up the wrong path,” he warned. “Extremism, be it of the far left or the far right, is not welcome in Australia,” he added. Amid growing condemnations, far-right Dutch politician Geert Wilders has welcomed the launch of the Australian Liberty Alliance. “Many of you are disappointed by current political parties and have had enough of politicians who sell out our western civilization,” Geert Wilders said in the recorded message cited by the Guardian. “Like you, good people in Europe, America and Canada have had enough of politicians who don’t share our values and foolishly declare that all cultures are equal and who lack courage to speak the truth and say that Islam is the biggest threat to freedom today. “You too will soon have the opportunity to turn the tide in Australia,” Wilders added. Wilders, the leader of the far-right Freedom Party (PVV), was invited in February 2013 at the Q Society, to speak against what he calls the “Islamization” of Europe. Politicians had warned that his hostile rhetoric fuels racism and bigotry against the sizable minority.